The Quincy High team unwinds after a practice as their gear airs out. Pee youuuuuuu. That’s the distinctively disgusting smell of the hockey equipment bag. Unzip it at your own peril. It contains a witch’s brew of bacteria, sweat, mucus, dried blood, metal, foam, and plastic. The scent has been described as a combination of rotten eggs, dirty socks, a wet dog, and low tide. The hockey bag smell drives hockey moms bonkers. “I’d say the hockey bag is the smelliest thing in the world,” said Laura Norris as she gazed lovingly at her son Cal, a clean-scrubbed 7-year-old munching on pizza before a Bruins scrimmage game. On tournament days, she said, his bag is distinctive. “It smells like a combination of really bad-smelling feet, throw up, and probably a little bit of a dirty diaper,” said Norris. “It gets aired out after every practice, except if it’s not warm enough, then unfortunately it gets aired out in my kitchen. 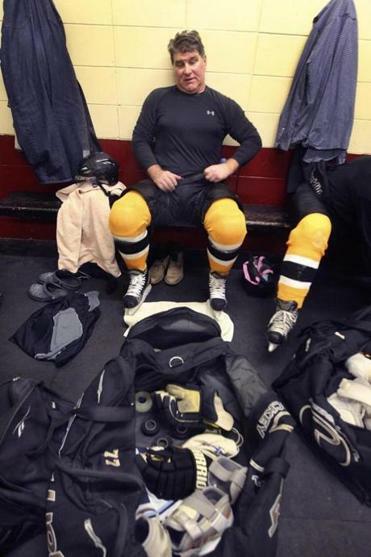 Bruins great Ray Bourque always aired out his bag as a kid — and he still does after informal skates at Hockey Town. Former NHL enforcer Chris Nilan said his mother viewed his stinky bag as a major misconduct. “My mother used to go nuts,” said Nilan, who grew up in West Roxbury. “I was too tired and lazy after practice to unpack it and air it out. Nilan said the odor is unique to hockey. “They just stink from the sweat and throwing stuff in,” he said. “It’s a cloth bag. It retains the sweat, that musky smell. You clean your underwear but you still have the scent and it kind of ferments a little. To Nilan, though, the aroma is nirvana. Jack O’Callahan was part of the “Miracle On Ice” 1980 US Olympic team that upset the mighty Russians en route to a gold medal. The pride of Charlestown played seven seasons in the NHL before co-founding Beanpot Financial Services in Chicago. His olfactory receptors are a bit eccentric. O’Callahan’s 1980 Olympic bag is one of his most cherished possessions. “My ’80 bag is in a safe deposit box in Glencoe, Ill., with the other stuff, probably stinking up everyone’s diamonds,” he said. Washing someone’s hockey bag can be the ultimate show of love. It can even lead to a diamond. Heather Stone of Pembroke used to wash her then-boyfriend’s stinky hockey bag while they were dating in 1999. Jim Stone says he likes the way his hockey bag smells. Today, the couple have four kids and seven hockey bags. Jim and the kids are allowed in the house; the bags are not. Other wives are not as fortunate. Anthony Sorrentino of Lynn hates when his hockey stuff gets frozen outside in the winter. “We play late, so when I come home, I’ll put my stuff in the spare room where the computer is and shut the door so it doesn’t stink up the rest of house,” he said. “My wife will get up at 5 a.m. to go to work, and she’ll walk in to go use the computer and there’s my raunchy, stinking hockey bag with no windows open. And you can hear her gag. In the Bruins locker room at TD Garden, Chris Bourque, 26, smiles at the subject. He survived the old Boston Garden as a kid with his father, Hockey Hall of Famer Ray Bourque. “I’m used to the smell,” he said. “I grew up in a locker room, so it doesn’t really bother me. Bruins defenseman Zdeno Chara, whose hockey bag never left the arenas in his native Slovakia, also thinks the smell is getting better in the NHL. The Bruins were one of the first NHL teams to buy an $11,000 ozone-infused sanitizing machine to reduce bacteria and eliminate odor from equipment. Former Bruins center Joe Thornton developed a serious staph infection on his elbow in 2002 and then an infected cut above his eyebrow the following year that required hospitalization. Now, 27 NHL teams have the Sani Sport cleaning units in their locker rooms. “It’s not funny,” said Sani Sport president Steve Silver. “The smell is not the big deal; the fact that the smell is eliminated is a nice byproduct. “The reality is that the smell is caused by upwards of a million living organisms on the average set of hockey or football equipment. “You get an abrasion on your skin, and ironically the bacteria from the shoulder pad or the skate or whatever piece of equipment that is supposed to be protecting you, bacteria from there can seep into your skin and cause things like MRSA [methicillin-resistant staphylococcus aureus]. The Bruins take all of this all very seriously. “We’re very sensitive to that kind of stuff,” said defenseman Dennis Seidenberg. “You get a cut or just a little scratch, you’ve got to make sure you cover it with a Band-Aid and ointment. Make sure it doesn’t get inflamed. If some bacteria gets in, even a little scratch could be trouble. A couple of the game’s greats say that cleanliness and odor elimination begin with young players taking care of their own dirty stuff. At Hockey Town USA in Saugus, Ray Bourque skates incognito in an afternoon pickup game, steam rising from his broad shoulders as he heads to the locker room. Bourque says the problem begins with teenagers who just leave everything in the bag. “They sweat and they don’t dry it out,” he said. “It doesn’t smell very good, but you’ve got to take care of it, just like anything else. Fellow Hall of Famer Bobby Orr thinks a reporter asking about smelly hockey bags is sniffing down the wrong path. “I don’t know what smell you’re talking about,” he said. So hockey gods don’t smell? Orr smiles that still-boyish grin. “I dried my equipment out as a kid,” he said. “Mine didn’t smell. I don’t remember my duffel bag having an odor. But what of mere mortals? “Well, the problem we have is the kids expect the parents to carry the bag, hang the equipment up, and so on and so forth,” said Orr. “I took responsibility for my own and I didn’t wait for my parents to do that.